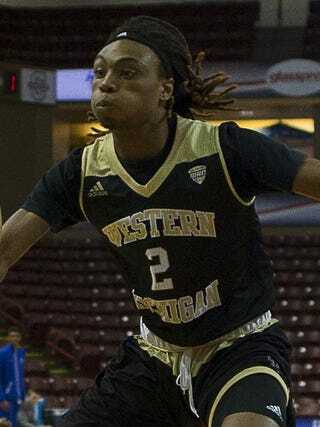 A basketball player at Western Michigan University was charged with murder and robbery Monday after he allegedly gunned down another student during a robbery for a phone and money. Jovieair Kennedy, 20, was arraigned Monday on charges stemming from the off-campus shooting of 19-year-old Jacob Jones at a Kalamazoo, Mich., apartment Thursday. The Detroit Free Press reports that Kennedy, who is from Muskegon, Mich., was denied bond and does not yet have an attorney. Kennedy is charged with murder, armed robbery and using a gun during a felony, and according to the Free Press, the charging document indicates that others were present. WMU Athletic Director Kathy Beauregard said Friday that an athlete had been suspended after being identified by police as a person of interest, but she did not name the student or the sport in which the student participated, the Free Press reports. Although the school would not confirm that Kennedy was the athlete identified by police, he was not on the roster for Saturday’s game against James Madison, and coach Steve Hawkins spoke in general terms about the situation after the game.